Cheapys.com - Cheap Playstation Games and So Much More! => Cheapys.com - Cheap Playstation Games and So Much More! Cheapys.com Sells Cheap Playstation Games, as well as Portable CD Players, Portable AM/FM Radios, Clock Radios, MP3 Players, and So Much More! Cheapys.com Price - $362.99, Plus Shipping and Handling. With the PlayStation 3 160GB system, you get free PlayStation Network membership, built-in Wi-Fi and 120GB of hard disk drive storage for games, music, videos and photos. And every PS3 system comes with a built-in Blu-ray player to give you pristine picture quality and the best high-definition viewing experience available. 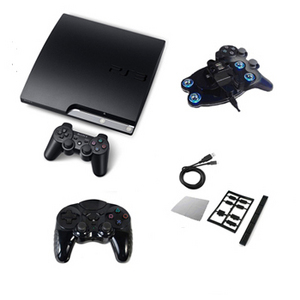 Whether it's gaming, Blu-ray movies, music or online services, experience it all with the PlayStation 3 system. Click Here For More Information ~ On All Our Playstation Games. We want to hear from you. Please tell us how we are doing? Your comments, stories, or complaints are welcome at Cheapys.com. We want to improve your shopping experience, and the most important way we can improving what we do is by listening to you. If you want a response, or follow-up, let us know. Thank you for helping us to be the best we can be for you. Were Your Patronage Is Appreciated.